A wine label is basically all we have to go by when deciding whether a wine is going to be any good. A wine label may be flashy or serious-looking. It may be embossed. It may be funny, clever and memorable. None of these things will help you determine the quality of the liquid inside. In fact, it is the least interesting parts of the wine label (at least at first glance) that can be the most important for determining the wine’s quality. These include region, vintage, alcohol content, the details of the producer, etc. Wine label requirements are very specific and prescriptive in Australia and New Zealand. For us as consumers, this is a good thing. A wine label doesn’t have to specify the region the grapes were grown, but if it doesn’t, that begs the question – why not? Most likely because it is not a great region. If a wine comes from a reputable growing region, the producer will proudly display the fact on the front label (Penfolds in an exception – their excellent wines do not often specify regions, but they have such a powerful brand that they can operate on their own terms). If the label proudly displays the region of origin, it is required to be accurate for 85 per cent of the blend. Choose a wine with a specific, reputable region for that variety (i.e. not ‘South Eastern Australia’). 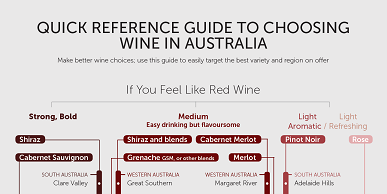 The guide to choosing wine at the bottom of this page will give a you the best start in choosing a great region. Again, the vintage does not have to be specified (as per non-vintage or NV sparkling wines and many fortified wines). However, wineries know that people want to see what year the wine was made, so it will be there on the front label in most cases. There is much contention about the importance of vintage conditions, and the difficulty in rating them for each region. Viticulture and winemaking practices have improved so much in the past 30 years in Australia and New Zealand that vintage is far less important than it was, at least for everyday-affordable wines. As per the region, a small percentage of the wine can be from a different vintage that the one specified, but that shouldn’t be detrimental to the quality of the wine overall. You’ll want to avoid ‘home brand’ wines. These are brands with labels, stories and motifs that are often entirely prepared by major supermarket chains. You only should be on the lookout for these if you’re in a large chain bottle shop or online store such as Dan Murphy's, First Choice, BWS, Vintage Cellars, Liquorland or the online retailer Cellarmasters (owned by Woolies). These are often great places to buy wine, so don’t get me wrong – I like buying wine from these places myself, however you do need to be on the lookout to avoid their ever-increasing home brand wines. Home brand wines can be OK, but they can be ‘hit and miss’. They are often sourced on the bulk wine market and sold by producers who want to sell a parcel of wine without associating their own brand with it (for example, the wine that doesn’t make the cut). The producers of home brand wines brands effectively have less at stake when they package a sub-standard wine under a home brand because they can just make a new brand if the old one loses favour. Many boutique producers are concerned that home brand wines are undercutting them because the larger companies can leverage their size and scale to lower productions costs too. In 2012, the executive director of Wine Grape Growers Australia told Choice Magazine that the supermarket home brand wine is of a lower quality, but is being sold at a premium price. Many would argue that home brand wines deliver great value. The debate goes on. It is hard to pick a home brand wine. If the winemaker or viticulturist is named on the wine label, you can be more confident that it is not a home brand wine. It is easy for the supermarket chain to fabricate the name of a winery, but a little trickier to fabricate a person. The best way to avoid these wines is to check against a known list of brand names. Huon Hooke maintains a comprehensive list of Coles, Woolies and Aldi wines here.